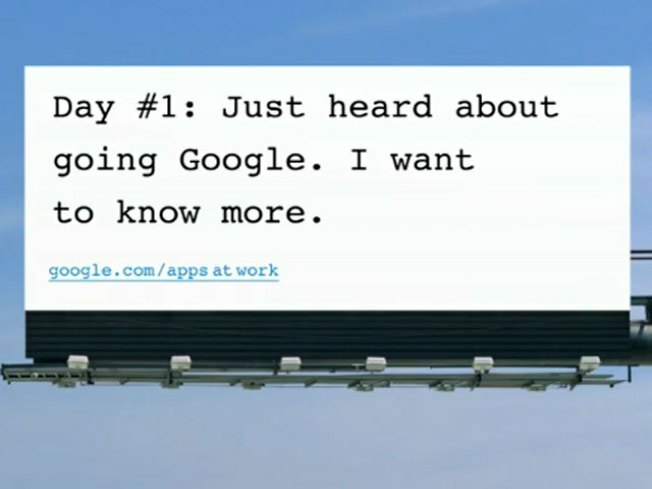 Google's 30-day campaign targets IT professionals commuting to work, with billboards like this one. Sure, Google Inc. is so well-known that it has become a synonym for search, making traditional advertising for its ubiquitous web-crawler unnecessary. But getting businesses to buy Google's online suite of office applications requires a little more elbow grease and marketing muscle. In a rare commercial campaign, Google is leasing billboards along major highways in New York, San Francisco, Chicago and Boston this month to promote a bundle of business applications that sells for $50 per worker annually. A different message will be displayed each weekday through August, starting with Monday morning's commute in the campaign the company calls "Going Google." For the next 30 days, commuters in the four cities across the country will see messages on billboards like, "Just heard about going to Google. I want to know more." and "Email, shared docs, and team sites? Nice. I want to go to Google." The billboard campaign targets IT professionals waiting in traffic and underscores just how determined Google is to lure corporate customers away from Microsoft Corp.'s e-mail service and industry-leading applications for word processing, spreadsheets and scheduling. To a lesser degree, Google also is targeting IBM Corp.
Google has been peddling its "apps" package since 2007, but execs only recently determined that the company needed a more aggressive sales pitch. "People don't necessarily think of Google when it comes to how we can help companies," said Michael Lock, director of sales and operations for Google's enterprise division in North America. For now, the Mountain View, Calif.-company doesn't plan to advertise its business applications in other offline media like magazines, newspapers, television or radio, said Andy Berndt, managing director of the company's creative labs. Google has been escalating its attack against Microsoft just as its search engine is under assault. Hoping to narrow Google's commanding lead in the online ad market, Microsoft last week forged a search partnership with Yahoo Inc. in a deal that still requires regulatory approval. Microsoft also upgraded its search engine in June and renamed it "Bing" -- a change that is being trumpeted in a $100 million marketing campaign. By contrast, Google has rarely bought advertising to promote its search engine since its inception nearly 11 years ago -- instead relying primarily on word-of-mouth and free media exposure to establish the search engine as one of the Internet's most powerful tools. The strategy has worked well, with the advertising connected to its search engine generating $10.7 billion in revenue during the first half of this year. Software licensing, including Google's sales of business applications, and revenue from other non-advertising sales accounted for just $365 million in revenue during the same period. Google says about 1.75 million businesses, schools and government agencies use its online applications, but most of them rely on a free version that isn't as powerful as the subscription package. That's a small fraction of how many companies license Microsoft's software. Google evidently believes its message is catching on. The company hopes to increase its business sales force by about 25 percent by hiring about 100 workers at a time Google's overall payroll has been shrinking. Google ended June with nearly 400 fewer workers than it had in March. "The expansion is needed to handle the interest and demand we are seeing in Google's apps," Lock said.